Definition at line 125 of file CQValidator.h. Definition at line 34 of file CQValidator.cpp. 38 mValidBound("\t") // It is not possible to insert a tab. 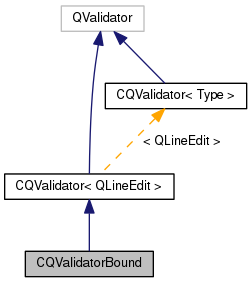 Reimplemented from CQValidator< QLineEdit >. Definition at line 59 of file CQValidator.cpp. References CQValidator< Type >::force(), and mValidBound. Referenced by CQFittingItemWidget::slotLowerEdit(), CQFittingItemWidget::slotUpperEdit(), and validate(). Definition at line 41 of file CQValidator.cpp. 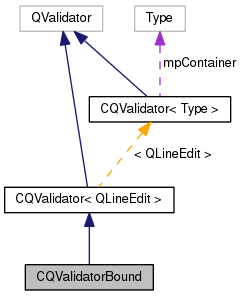 References force(), mpDoubleValidator, mSign, mValidBound, and CQValidator< QLineEdit >::setColor(). Definition at line 137 of file CQValidator.h. Definition at line 139 of file CQValidator.h. Definition at line 141 of file CQValidator.h. Referenced by force(), and validate().